Paper Sleeve Limited Edition - Only 1,000 copies pressed! A collection of previously unreleased materials by the Kenny Drew Trio, originally recorded for Japanese labels Baystate and Alpha beween 1972 and 1992, now released to commemmorate the 20th anniversary of his passing. A rich trove of superb piano trio performances! 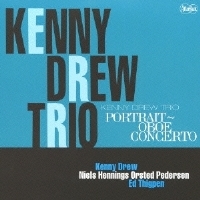 American pianist Kenny Drew (1928-1993) moved to Copenhagen, Denmark, in 1964. Although he may have somewhat faded from the radar of American jazz fans, he had a fantastic career in Denmark and was beloved by European and Japanese jazz fans. In the late 1970s and 1980s, Drew's popularity in Japan grew to incredible heights when he began recording for Japanese labels such as Baystate and Alpha under a partnership with Japanese producer Makoto Kimata. To commemmorate the 20th anniversary of Drew's passing, a very special series was launched in Japan in 2013, with a release of previously unpublished materials recorded for the two labels between 1972 and 1992. Most of them are alternate takes and takes that did not make onto the original albums released in this period, and Drew was accompanied by bassist Niels-Henning Orsted Pedersen and drummer Ed Thigpen or Alvin Queen. It is quite amazing to hear the consistently high quality of these "outtakes." Actually, many of them tend to be more exciting than those takes that made the original albums. They may have been "cut" because they were slightly rough around the edges, but perhaps they were played with more freedom, abandon, and adventurous spirit. This particular CD is a collection of unreleased materials recorded between 1982 and 1991 with Ed Thigpen on drums. A note on "Oboe Concerto" by Marcello: It was used in an Italian film Anonimo Veneziano the main character of which was an oboist. Recorded at Easy Sound Recording, Copenhagen, between 1982 and 1991.